Is Recreational Metal Detecting on the Endangered List? Metal Detecting took form in the 1950-60s and the detectorists who were metal detecting at that time had very few restrictions and the finds were fabulous. Metal detecting during this period can be described similar to being in the old west with open ranges and anything goes. The finds stories from those in the hobby during that period are hard to believe against today’s detecting results. So is Metal detecting on the Endangered List? Let’s take a look at the barriers and variables that affect the hobby. The Law: Today, the U.S. metal detecting environment is controlled by a hodgepodge of Federal, State, City, County laws. A major reason for this is that there is no regulation, law or statue at the Federal level that provides any support for recreational metal detecting. The four acts indeed do protect Americas Heritage but at the same time limit or in most situations make metal detecting an unlawful act. If someone is caught metal detecting in National Parks, National Historical Sites, National Monuments, National Recreational Areas, Native American Lands or on archaeological sites the penalties can be severe. There are a few exceptions where portions of Federal Forest Service and BLM lands allow metal detecting if no archaeology sites are present. During the past 35 years most, if not all, of the fifty states now have laws modeled after the federal acts thus making many state lands unavailable to metal detecting. Many states have also enacted specific metal detecting laws that make it unlawful to detect, or may require special permits and permission to metal detect state land areas. The result is that individual state laws have direct impact and control over recreational metal detecting in the 50 states. Of course this includes state parks, historical sites and state archaeological sites. Usually metal detecting laws are very different from state to state. In more recent times counties, cities and school districts have also enacted regulations that restrict, forbid or require a permit to metal detect. Each year in the U.S. the list of cities, counties and school districts grows in length as new restrictions are exacted against metal detecting. The result is that more and more public lands are becoming unavailable to recreational metal detecting. Plus some states are in the process of enacting changes to their archaeology law which in the future may or will impact the ability to metal detect on private lands without specific permits and permission. Governmental Staffing. The federal government has agencies or very large departments that support the various acts related to the preservation of America’s Heritage. All of these agencies are fully staffed with professionals educated in their specific disciplines to protect and evaluate America’s heritage and resources. To compliment the Federal agencies are state agencies and departments which are also staffed, but at lesser levels, to handle the same types of issues. Counties and cities usually have staff in various departments responsible for the oversight of the same American Heritage issues. Currently you can find staffing at all levels of government that support America’s Heritage. So it has become very difficult to get laws and regulations passed, or just modified to support recreational metal detecting. There are now many barriers and no one in the public sector is interested or chartered in providing support for the hobby. National Detecting Association. In the U.S. there are no metal detecting associations that truly represent the metal detecting hobby. Yes, there are national associations in name but do they really represent the hobby at any government level? No. Occasionally, after an incident occurs these associations take up an issue. Therefore, they do take on small skirmishes but the associations are not pro-active in working with government officials just re-active to a given situation. The major reason for this is the lack of funding, the volunteer staff, and the lack of strong hobbyist loyalty to protect the hobby. What might be the requirements for an association that truly can, could and would represent metal detecting? Each of these organizations would be a good model to emulate for setting up new state association. Detecting Clubs. There are around 550 metal detecting clubs in the U.S. with only a small number of these clubs being actively involved in their local community; far more clubs take no leadership role in the support and protection of the hobby. Some large clubs with good organizational structure and membership involvement do not participate in any way at the national, state level, or in their community. Generally, clubs do not even have a training program for new detectorist, yet with the influx of new detectorists the need of such a program is very desirable. Clubs are usually centered on internal club events. This is good for the membership but in today’s environment these same clubs must dedicate people, club time and resources to do much more to support the hobby. The Hobby. With the retirement of the boomer generation the hobby will experience many new detectorists. These new retirees are looking for an experience that will provide exercise, enjoyment, a new challenge and getting outdoors. This influx of adults into recreational metal detecting may add to the endangerment of the hobby. Why is this? These new detector hobbyists are not educated on the laws influencing metal detecting, the responsibilities of the detectorist, the ethics, the proper recovery of a target and how to detect without annoying people in their immediate area. This lack of metal detecting knowledge can lead to damaging public and private properties as well as the public’s image of the hobby. This in turn may cause more lands to become off limits to metal detecting since public officials will be quick to make metal detecting unlawful if complaints arise. There is also the issue of proper etiquette while metal detecting. Etiquette encompasses the use of detecting ethics, the detectorist responsibilities and displaying proper respect for others in one’s immediate metal detecting area. Metal detecting etiquette will be a future mdhtalk article. Detectorist Responsibility. The term Responsible Metal Detecting can be found in the Code of Practice on Responsible Metal Detecting in England and Wales web link to responsibilities. However, the term Responsible Metal Detecting in the U.S. is rarely used or defined. Below you will find six major heading of an article on the responsibilities available on the MDHTALK website. Night Hawking. Night Hawking is metal detecting on public and private lands under the cover of darkness. As there is an increasing effort to curb the hobby by making more laws and greater enforcement of existing laws detectorist will out of desperation, turn to night hawking to detect and remove those remaining good targets. As the public becomes aware of metal detecting abuses such as night hawking, public officials will be lobbied more and more by groups that support the preservation of native American artifacts, historical sites and archaeological resources. The result will be more restrictions and greater enforcement against the hobby. Detectors Technology: During the last ten years metal detector technology has greatly improved by providing greater depth sensitivity, LCD displays, target id technology, software control, and enhanced coil technology. The detectors of today provide the user with the opportunity to detect targets at greater and greater depths. This greater depth capability is a plus for the hobbyist and can be a minus for the hobby. Putting this technology in the hands of inexperienced hobbyist can lead to the destruction both public and private land. This is because recovering targets that are much deeper can result in creating wider and deeper holes in the turf to recover the target. Without proper target recovery training these deeper target recovery efforts can be disastrous to the turf and in turn to the public’s image of the hobby. Environment. The laws to protect the environment, the laws to protect animal & marine species and laws to protect other archaeology resources will in the future have a greater impact on beach detecting (fresh & salt water). On salt water beaches during certain periods of the year you can find small taped off areas to protect turtle eggs. In the future as more attention is placed on protecting marine life you will probably see complete beaches and coastal areas un-accessible for public activities. There have also been numerous examples drafted to establish a National Landscape Conservation Program to cover BLM lands. This type of legislation could be similar to the national park regulations for outdoor use and be very restrictive. This legislation would impact all outdoor hobbies not just metal detecting. Fresh water beaches, lakes and streams are starting to be protected by archaeology laws as the states rush to protect more of America’s Heritage. In the future, these laws will become better defined and enforceable towards fresh water beaches, adjacent water areas, lakes and streams and will most likely make them un-accessible to metal detecting. Conclusion. The U.S. wide environment for recreational metal detecting during the past twenty-fives years has gotten much more restrictive and far more restrictions are expected in the next twenty years. Take a look at the graphic below. The “X” axis has key dates that concise with the four major federal acts plus today and the future. The “Y” axis represents how rapidly states, counties and cities have enacted laws and regulations supporting the federal acts. 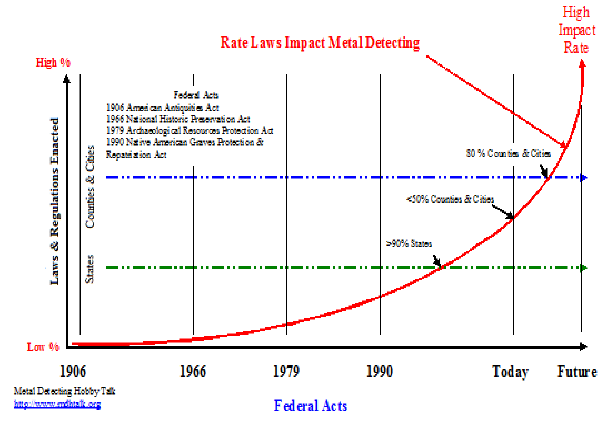 The red arc (line) from 1906 to the Future displays the rate at which public entities have adopted or created laws that indirectly or directly effect recreational metal detecting. High Impact Rate. This is the projected rate at which laws and regulations are enacted that will make metal detecting unlawful, or require a permit, or permission. Graphic Disclaimer. This graphics is based on the analysis of the federal acts, state laws, and the review of many county and city regulations. The percentages are a bit of a guess when it comes to the level of law enacted in each entity (states, counties, cities) however the error factor is probably relatively small. In summary the graphic is an interpretation of the previous discussed on the barriers to metal detecting and the variable that effect metal detecting as represented by the opinion of this author. As laws and regulations continue to be enacted in more and more public entities there is a lack of evidence that national detecting associations, state detecting associations and detecting clubs have had any impact on slowing down the generation of these laws and regulations. With many more inexperience detectorists entering into the hobby and using the greatly improved detector technology the issue is; there is no clear and consisted way to educate them on the dos’ and don’ts of the hobby. Finally, the future looks bleak when it comes to new environmental legislation that may be passed and in turn could impact the hobby’s future. By just looking at the time period from 1990 to today you can see that a great deal of change is taking place in relationship to the laws and regulations driven by the hobbies popularity and distrust of the hobby by those in government. The expectation is that this curve will accelerate in the next twenty years as the result of more regulation of the hobby. The result will be that at some point metal detecting will probably not be available on most lands in the U.S. So….. The question: Is Recreational Metal Detecting on the Endangered List? YES, one can find no evidences that the current trend rate will not continue to go up and to the right on the graphic. Currently, there is nothing in the works to change or diminish the metal detecting barriers or to alter the metal detecting variables. Next month there will be a follow-up article on some alternatives to aid the hobby. If you have an opinion about this article, or a possible alternate view, or a possible solution MDHTALK would like to hear from you.